Corruption affects the public and private sector as well as civil society in many concrete ways. It hinders a country’s economic capacity for growth, creates resource misallocation, stifles business opportunities, and allows for public distrust. The World Economic Forum and the World Bank estimate that corruption costs more than 5 percent of global GDP (USD 2.6 trillion) each year with over USD 1 trillion paid in bribes. In many parts of the world, corruption makes up 10% of the total cost of doing business and up to 25% of the cost of procurement contracts in developing countries. Respectively, the United States and Indonesia have made strides to mitigate corruption. In the United States, the Foreign Corrupt Practices Act of 1977 (FCPA) regulates anti-corruption efforts in the business sphere and prohibits bribery of foreign officials by U.S. businesses. In 2002, Indonesia’s Corruption Eradication Commission (KPK) was established and since then, has arguably been one of the most committed authorities against corruption in Indonesia. 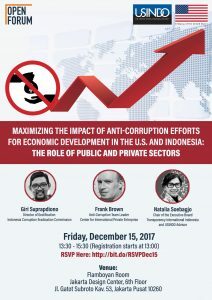 Despite these notable efforts, the United States and Indonesia both still face various challenges in tackling corruption in their respective countries. In addition, although many anti-corruption efforts center on government-mandated regulations, it also requires collective engagement from the private and public sectors to succeed. Through good corporate governance businesses can enhance integrity and anti-corruption compliance. Civil society organizations play a leading role in increasing public awareness and support in combating corruption. What is the current status of anti-corruption efforts in the two countries and what lessons can be learned from each other? Which policy changes and reforms have successfully reduced corruption and allowed the U.S. and Indonesia to better attract investments? How do we know whether and to what extent the existing laws have successfully reduced corruption, what loopholes may still be present, and what are the remaining issues to address? What are the main challenges in engaging the public and private sectors in anti-corruption efforts in the U.S. and Indonesia, and how can they be overcome? How does anti-corruption compliance benefit businesses and affect national economic growth? The United States-Indonesia Society (USINDO), in cooperation with U.S. Embassy Jakarta is delighted to host Mr. Giri Suprapdiono, Director of Gratification, Indonesia Corruption Eradication Commission (KPK); Mr. Frank Brown, Anti-Corruption Team Leader at the Center for International Private Enterprise (CIPE); Ms. Natalia Soebagjo, Chair of the Executive Board, Transparency International Indonesia and USINDO Advisor, in this open forum. Please join us for this informative event. To register, please kindly RSVP HERE, or email to usindojkt@usindo.org no later than December 14, 2017 at 5:00 PM to attend this Open Forum. Giri Suprapdiono is the Director of Gratification of the Indonesia Corruption Eradication Commission (KPK). Previously, he served as the Coordinator of International Cooperation at Directorate of Fostering Networks Between Commission and Institution (PJKAKI) KPK. He also served as the National Management Consultant for BAPPENAS-UNDP prior to joining the KPK. He was born in 1974 in Ponorogo and earned his bachelor’s degree in the Urban Planning Engineering, Bandung Institute of Technology. He later earned his master’s degree from International Institute of Social Studies, Erasmus University of Rotterdam, the Netherlands. Frank Brown is the Anti-Corruption Program team leader at the Center for International Private Enterprise (CIPE), a non-profit affiliate of the U.S. Chamber of Commerce. His work is focused on corporate compliance in emerging markets and the establishment of a transition hub to assist countries with the reduction of systemic corruption. Mr. Brown’s interests include innovative approaches to reducing the corrupt practices of firms in emerging markets; compliance with the U.S. Foreign Corrupt Practices Act and other anti-corruption legislation; and, support of anti-corruption compliance programs of large firms operating in highly corrupt environments. Mr. Brown is currently overseeing the launch of two new anti-corruption programs at CIPE. The first seeks to take a holistic, integrated approach to corporate compliance in emerging markets by training business leaders on not only international anti-corruption requirements, but also labor and environmental standards. The second program will create an anti-corruption transition hub to boost the resources available to countries with leadership newly empowered to reduce systemic corruption. In Indonesia, Brown is also involved in CIPE’s integrated compliance pilot project, partnering with Indonesia’s KPK. Prior to his work at CIPE, Mr. Brown spent eleven years as a journalist in Moscow, including a stint as bureau chief for Newsweek. He has reported on conflicts in Kosovo, Russia, Serbia, and Sri Lanka, as well as on business, politics and religion. Natalia Soebagjo is the Chair of the Executive Board at Transparency International Indonesia (TII), and Board Member of Transparency International (TI). She was a member of KPK Selection Committee member in 2015, Executive Director of the Centre for the Study of Governance at the University of Indonesia and member of the Indonesia Independent Team for National Bureaucracy Reform. She is USINDO advisor and Board member of the Perkumpulan Bung Hatta Anti-Corruption Award. Previously, Ms. Soebagjo has worked in the securities and financial industry, as well as in consultancy and the media. Ms. Soebagjo spoke in various national and international forums and gave interview at national and international media. She holds an MA in Asian Studies from UC Berkeley.